On Monday, I told you about my dumb luck or aptitude, however you would like to view it, for making fast friends. 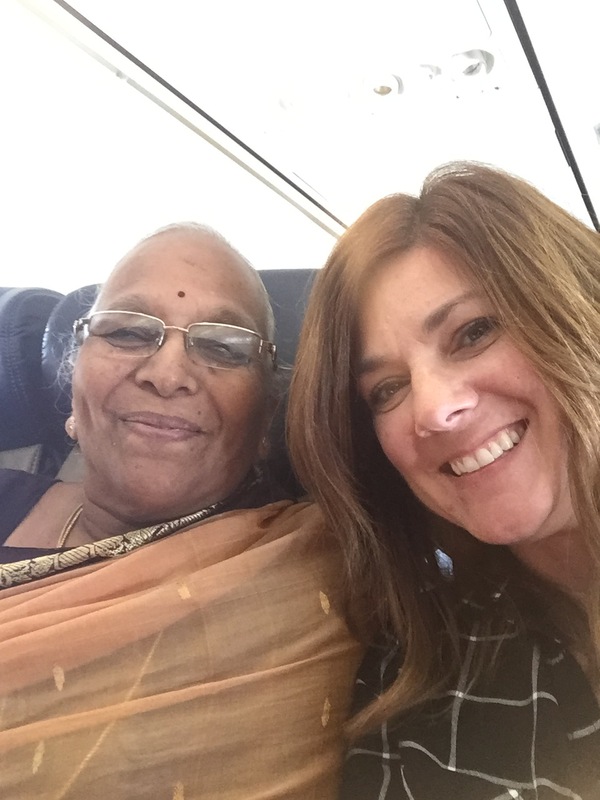 I wrote that blog prior to my flight home from Nashville and I would hate to leave this topic before mentioning that I have a newly adopted mother from India. It’s true. First of all, because I changed my flight and was trying not to spend a fortune to get home I bought a ticket from Nashville to Denver with a stop in Newark, New Jersey. Not exactly a direct flight, but hey I had never been to New Jersey so now I can mark that off of my bucket list. Anyway, just before the plane shut its doors a little Indian woman boarded the plane. With plenty of open seats, it never occurred to me that she would want to sit between me and the narcoleptic by the window, but alas she felt my energy and could not resist. When she stopped at my row and looked at me I, literally, felt like I had somehow been “chosen.” I know it sounds crazy but if you read our blog on a regular basis you already know we are slightly askew. So she proceeded to sit down with her beautiful sari and peaceful aura and with one look in my direction I knew it was going to happen: we were going to be fast friends. I began by admiring her sari and mentioning that we have several at home that my hubby has brought back form his many trips to India. There was a little small talk and then the iPad came out. Soon she was showing me photos of her three grown sons, their wives, her grandchildren, and her friends. I have seen photos of graduation, prom and each of their beautiful homes. Two of her sons live in the U.S. and one lives in India and what a beautiful family. In fact, she was traveling to New Jersey to stay with one of her sons through the holidays. Of course, she wanted to see photos of my family and hear about what each of my girls were like. Next thing I know, she asks me to take a selfie with her. We each took photos and then she took it one step further and asked me to email her. Because her English was pretty broken and I was practically in her lap straining to hear her already I asked her to type her email for me. Suffice it to say, we continued our conversation throughout the flight and by the time we arrived in Newark she was holding my hand and telling me I was the daughter she never had. At this point, our narcoleptic neighbor had emerged from her slumber and, clearly, thought she had entered the twilight zone from the look on her face. Obviously, she doesn’t know how to make fast friends. I have been instructed to visit my newly adopted mother, Lalitha, in India and she has promised to cook for me and take me to the Taj Mahal. I can’t even begin to tell you how amazing this woman was, but I think the email I received from her son a couple of days later might help you to understand and as an added bonus I have a brother in New Jersey! I always wanted a brother! This is Raj. I am writing on behalf of my mom since she is not familiar with sending out Emails yet. We are working on it. She was thrilled after she saw your email. When I picked her up from the airport the first thing she said to me was ‘ I now have a daughter in Denver’. We know all about you and your 3 girls. Please stay in touch and if you get a chance send my mom a picture of your family. If you are ever in the Tri-state area let us know. So what is the life lesson? Be open and connect. There are a lot of brothers and sisters out there just waiting to connect with you! Click here for Day #30 of Savor Fun. Welcome home after a wonderful experience! Will there be a lowi & g India segment in the future? Do they run ultras there? Thank you! You just never know what G and I might have planned in the future. As far as ultras, we can run lots of miles anywhere, but oh is it hot in India! this is beautiful! and I completely understand the making fast friends thing. i inherited it from my mother! as a child and teen, i did NOT appreciate this talent. it seemed annoying and crazy and weren’t we enough (rolling eyes here). Suddenly as an older adult, I have found myself, talking to people I never would have in my younger years, in fact I met a fascinating woman in line at Brene Brown’s event in Nashville. Her child had been a competitive figure skater(as had mine) and it opened up a whole world we were familiar with. We spent the day together, and it made my experience even more rich, to have someone to share the moments with. I find these events happen so often that I know they are not coincidences. they seem like little ropes of life, inviting us to participate …. and they always pay off! I hope to hear more of your Indian friend. Who knows, you are as likely to see her in India as New Jersey!